My drive to create a unique artistic process has led to the development of a production-based synthesis between metals, plastics and the natural forces that act upon them. In this way, I re-constitute refuse from human industry into skins that record those objects entropy and transformation. 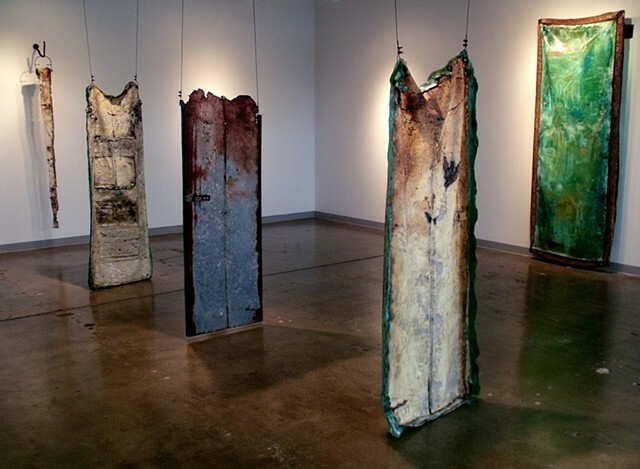 Since the invasive creations of industry already populate much of this planetfrom the decay of concrete and steel infrastructures to the "Texas sized" zone of accumulated plastics drifting somewhere between Hawaii and Japan it becomes important to study, engage and manipulate these industrial cast-offs and determine the effect upon the viewer once confronted. Where the viewer arrives at oblivion through conflict and uncertainty, over confrontation with a world that expresses both the alien and familiar, I aim to create such a world from the entropic membranes shed by civilization's decay. Toward this end I re-manufacture industry's bones through its nature's skin.